Right when things were getting busy, my friend Mary (a.k.a., the Food Floozie) passed on three awards to me as one of the new blogs she's discovered. I couldn't argue that either. Hold the phone. I imagine Meredith would disagree, however, I did manage to woo her while picking my own clothes. Or is this about how I present my blog, and the quality of the pictures? Aha! I'll leave my wardrobe out of this! a. Although I'm referred to as the techie guy, I've never owned a smartphone (my current phone is almost six years old) and I don't play videogames. b. I'm currently raising money for prostate cancer research through Movember, and I've raised a little over $250 so far. c. I'm very proud of my wife, Meredith, who courageously started her own travel business last year as well as (re-)taught herself to knit. d. This past November 5, my wife and I spent half the day watching the entire Back to the Future trilogy. e. Kermit is my favourite Muppet. f. I play in a community concert band called Resa's Pieces. I discovered the band after finding an old school friend on Facebook who invited me to join the band. g. My favourite baked good is the rosewater chocolate bun that my grandmother used to make. A year after she passed away, I found a bag of them in my grandfather's freezer. 3. 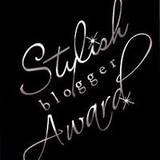 Pass the awards on to five new blogs you've discovered and contact the bloggers about the awards. It's up to them to accept the award and spread the love. One of my best friends started a blog very recently and he's found the writing process to be a great outlet. Although not a brand-new discovery, my sister-in-law recently decided to become a regular contributor. Her gluten-free adventures are a good read. The Food Junkie reviews restaurants wherever she goes - many in my hometown. A recent discovery with lots of neat recipes from various cuisines.